Never ask yourself “Where’s the flour?” again, thanks to these smart storage tricks. The kitchen closet is responsible for a lot of storage, and it’s all too easy for the pantry to become and out-of-sight, out-of-mind catchall for half-empty containers, spare plastic bags, and more. Use these clever tricks and strategies to get your shelves in order so that cooking, putting away groceries, and packing snacks for school lunches can be easy as opening the pantry door. Take advantage of any spare kitchen space by adding a set of industrial wire shelves. You can soften the look with baskets. 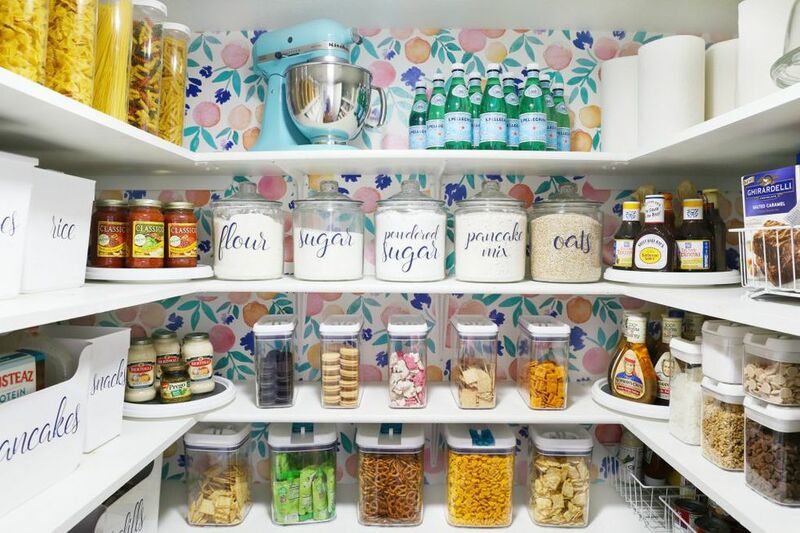 Store dry goods against a colorful background to make your pantry instantly appear more orderly. Scan thrift and antique stores for wooden soda crates to corral items that go together. 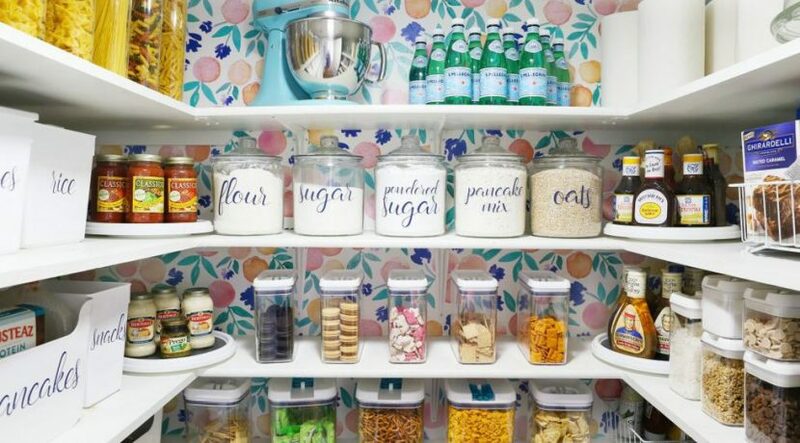 Line the walls of your pantry with a favorite pattern to instantly jazz up the space. Keeping a pretty background visible is the best motivation to keep contents orderly. Store cans and spices on bleacher-style shelves (whether built-in or purchased) that allow you to easily see the label of each item. Hampers aren’t just for laundry! Use them for larger items, like spare shopping bags, in your pantry. Go ahead and make use of those super-high shelves by installing or keeping a ladder or stool in your pantry. Don’t waste an inch of pantry space! Hang hooks underneath shelves to store extra mugs. Stock up on jars large and small for all your storage needs. You can even take the jars to grocery stores that sell bulk staples like grains and beans to purchase food at a lower price than its prepackaged counterpart. Keep track of what’s what with cute, decorative decals marking flour, sugar, and more. Pro tip: Use a dry erase marker to write down the expiration date before you decant it into the container. Paint your pantry door or walls with chalkboard paint to create an easy place for making grocery lists or displaying weekly meal plans. Don’t let any space go to waste! Store condiments, spices, and other small items in a rack on the back of the door. Short on actual pantry space? Install a set of floating shelves to a wall to add more storage.